clocks:10m:22, originally uploaded by monkey_pushover_tree. Start: At the back of the cave, just left of Its about 22. Fabulous chossy roof pumping! Follow the line of ring bolts towards the Harbour Bridge. Either lower off the fixed carabiner (scoring a grade 21), or continue up as for its about 22 (and give yourself a 22). Yeah I wish I was good enough to climb it, and that you still were allowed to do so! The sudden re-interest in climbing is partly my fault and partly Rob and Amys fault. Rob is a really good climber, even if he says he is rusty. Both of them are forcing me to challenge myself when climbing. I find I’m doing harder more technical routes than when I was climbing with lemming in the UK. With Rob and Amy, its a real challenge. Both of them push you to your limits. They have been both climbing far longer than me, so I’m playing catch-up now. Is climbfit as technical as the The Castle, I just don’t know. I do miss not knowing the exact grade climb that I’m doing (The castle has every route graded and marked). It’s also not as big, but boy is it fun. What I really want to do is to be good enough to start climbing outside. 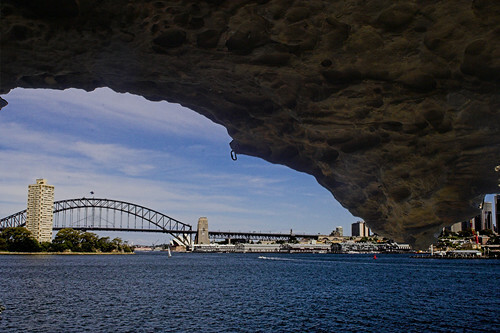 The above photo is a classic Sydney route that you are not allowed to climb any more. We got to see it on Christmas day. God it looks awesome! You stare at it and want to just try it. You can see the old chalkmarks which are now ingrained into the rock. It’s simply beautiful. Oh well, maybe one day they’ll remove the ban on this piece of rock. ~ by monkeypushovertree on December 28, 2006.